Only 2! But I’ve always loved Halloween for the reason that I could dress-up in crazy costumes. Some of my costumes were pretty epic, my mom used to make them when I was little. 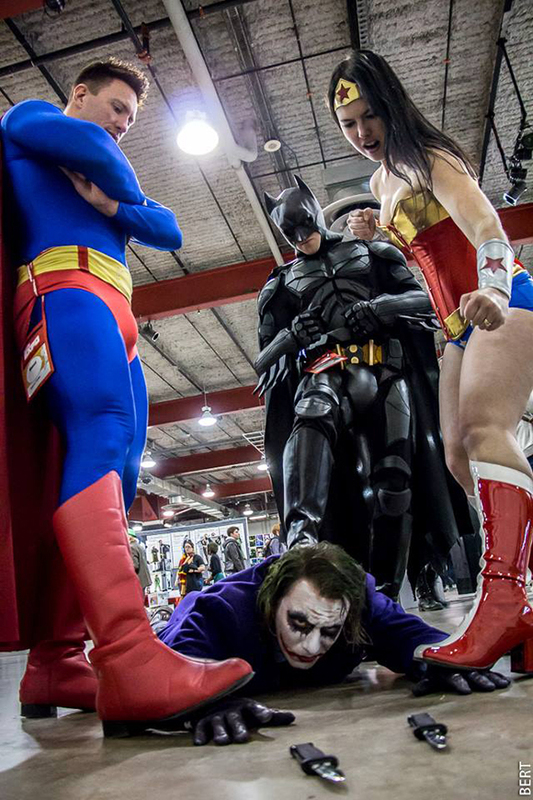 I got into cosplay because I was going to my first ever event (Calgary Comic and Entertainment Expo in 2012) and my buddy and I wanted to go full out and dress-up, it took off from there. 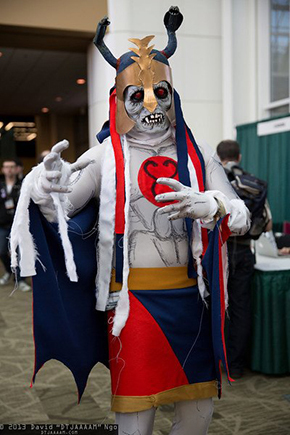 Definitely my Skeletor! It’s the Filmation version so it’s pretty bare-bones (pun intended), and a lot of people in their twenties and thirties totally dig it. 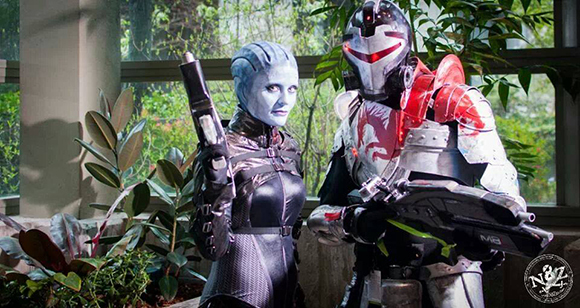 Although, I’ve been getting some action on my Commander Shepard blood dragon armor from Mass Effect lately. The favorite character/design that I did was my Commander Shepard Blood Dragon Armor from Mass Effect. I absolutely LOVE Mass Effect and Dragon Age and thought this would be a perfect way to express that love for both series. I still don’t know how to sew properly 🙁 Although if I did, it would help my costuming A LOT! I didn’t really know how to fabricate either, but I’m learning. There is a ton of reference material online and the community is a great support system. 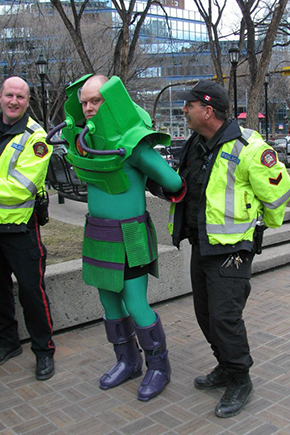 Skeletor started out with some light sewing and painting, I did a Lex Luthor Warsuit (Super Powers style) that was made out of Rubbermaid containers. My Blood Dragon Armor was a mash-up of Rubbermaid and other plastic parts. I’ve discovered EVA foam recently and did a Batsuit. It turned out fairly well. I’ve also been playing with LED’s and wiring so that’s fun. It usually takes me a couple of months per costume. I’ve got 3 little girls at home that keep me pretty busy. But on the weekends, once they go to bed, I’m up until 2, 3, 4 in the morning working in my shop. Not really, I do want to advocate the use of Rubbermaid though, that stuff is great! I’ve actually met Tom Cook (original Filmation animator) a few times. He’s a great guy. Also got to meet Scott Snyder while in the Lex suit and I quote (from his twitter) “best luthor i’ve seen” end quote. BAM! My bud and I were also on an episode of Toy Hunter (as Mumm-Ra and Lion-o) and were looking at buying figures of ourselves. Weird right? I don’t know if anyone else will find this funny, but the first year we went to Calgary we were taking pictures with some people outside the main building and my buddy elbows me in the gut and says “Dude, check it out!” I look over to my left and Marina Sirtis (Counselor Deanna Troi from Star Trek: TNG) comes out of the building and gives us a look, then Michael Dorn (Warf) comes out and is looking at us and then Brent Spiner (Data) comes out and I’m like “I LOVE YOU BRENT SPINER” in my Skeletor voice, he looks at us, gives the wink/nod/finger point combo and says “Looking good chaps!” Then they got into a black SUV and drove away. Like I said, it’s funny to me. In my short amount of time doing it, there are sooo many. Anytime a 30 year old guy comes up and is like “You guys are my heroes, I loved you when I was little!” Definitely is a memorable moment (and it happens a lot). 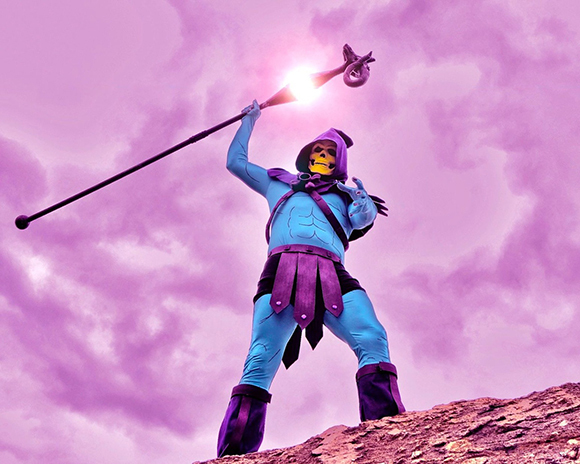 BeingCosplayer of the month for He-Man.org was also a feather in my cap. I love all of DC’s new 52 stuff. I’m a bit behind, but man is it good. Anything 80’s is also great, Loved the Chris Claremont X-men and also loved the Age of Apocalypse storyline. I’d have to say Superman and Colossus, although Batman is definitely making a run lately. Anyone who goes out in costume and does their thing is tops in my book. It takes a lot of courage. I’ve done various “Heroes for Health” events at schools promoting exercise and healthy eating, as well as some food bank fundraisers. I’d definitely like to get into more of this kind of thing. I’ve done a few birthday parties, it’s great to see big smiles on kids’ faces. I like to read, keep up on my favorite shows, play video games, play squash and also cook (not squash though); playing with my kids takes up a good chunk of my free time. Decide on a character that means something to you, take your time, learn some techniques and make a great costume. If you’re unsure of a certain technique, reach out to the community, they’re all helpful and great group. Like anything, you’ll get better the more you do it. Check out my facebook page @atomickings on twitter or instagram. You can visit the website www.hemanfan.com, it’s got links to youtube, facebook and twitter accounts.